Q is for Quinoa + Alkaline Recipes to Try! This is the 17th installment of our alkaline foods series where we feature a food from A-Z, sharing the benefits of the food along with suggested recipes to try! 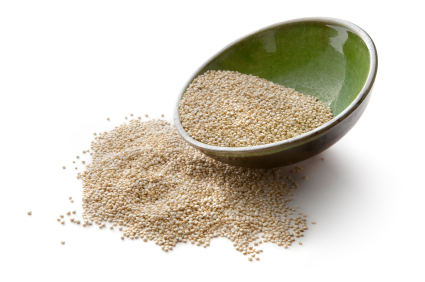 Quinoa is a seed that is a great replacement for grains like rice. It is gluten-free, has a low glycemic index and is rich in protein, fiber, calcium, iron, vitamin B, manganese and magnesium. For more alkaline recipes from around the web, visit and follow our Alkaline Diet & Recipes Pinterest board. Stay tuned for the next installment of our alkaline foods series: R is for Radishes. P is for Parsley + Alkaline Recipes to Try! This is the 16th installment of our alkaline foods series where we feature a food from A-Z, sharing the benefits of the food along with suggested recipes to try! Parsley is rich in vitamins A, K, E, and C, beta-carotene, antioxidants, folate, calcium and iron. For more alkaline recipes from around the web, visit and follow our Alkaline Diet & Recipes Pinterest board. Stay tuned for the next installment of our alkaline foods series: Q is for Quinoa. O is for Onion + Alkaline Recipes to Try! This is the 15th installment of our alkaline foods series where we feature a food from A-Z, sharing the benefits of the food along with suggested recipes to try! Onions are rich in vitamins C, B1, K, and B6, biotin, chromium, folic acid, calcium, sulfur, antioxidants and dietary fiber. For more alkaline recipes from around the web, visit and follow our Alkaline Diet & Recipes Pinterest board. 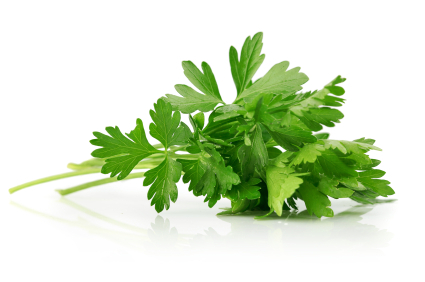 Stay tuned for the next installment of our alkaline foods series: P is for Parsley. N is for New Baby Potatoes + Alkaline Recipes to Try! This is the 14th installment of our alkaline foods series where we feature a food from A-Z, sharing the benefits of the food along with suggested recipes to try! 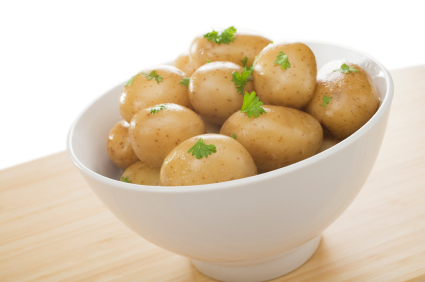 New baby potatoes contain B vitamins, vitamin C, potassium, and fiber. They are low in fat and easy to digest. For more alkaline recipes from around the web, visit and follow our Alkaline Diet & Recipes Pinterest board. Stay tuned for the next installment of our alkaline foods series: O is for Onions. The Dangers of GMOs: Do You Really Know What’s in Your Food? Ever seen a live pig with a glow in the dark nose? How about a tomato with fish gills? Or a pig with the hyde of a cow? These are not the works of science fiction, or the results of a science experiment gone wrong. These creations are possible with a laboratory process where genes from the DNA of one species are extracted and artificially forced into the genes of an unrelated plant or animal. Substances which have undergone this process are known as GMOs (genetically modified organisms). The transfer of new genes (which may come from bacteria, viruses, insects, animals or even humans) can disrupt the finely controlled network of DNA in an organism. Any change to the DNA of an organism can have side effects that are impossible to foresee or control. This could lead to instability, the creation of new toxins or allergens, and changes in nutritional value. Even the major retailer Whole Foods was recently outed for carrying foods containing GMOs despite advertising a strict no GMO policy. Not surprisingly, the #1 contributor AGAINST prop 37 is Montsanos, the worlds largest GMO soy distributor. Other opponents include Pepsi, Coca-Cola, Nestle, General Mills, Kellogg, Del Monte, and Hershey’s. Remember, we are not science experiments. Read labels, and make conscious decisions regarding the food you eat and the food you feed your family.